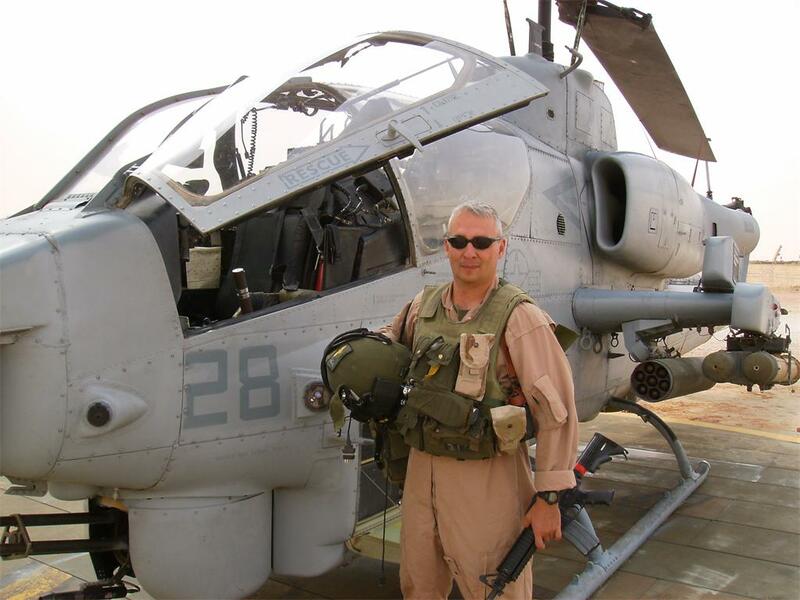 35, from Belgrade, Maine, assigned to HMLA-469, MAG-16, 3rdMAW, 1stMEF, died on October 29, 2009 during a night time aviation mishap off the coast of San Diego. Major Samuel Carson Leigh made national headlines when the AH1-Super Cobra that he was piloting was struck from behind by a C-130 Coast Guard plane off the coast of San Diego during the early evening on Thursday, October 28, 2009. The Coast Guard transport plane was carrying seven crew members heading south from Sacramento, CA while on a routine search and rescue at sea. Along with Major Leigh, First Lt. Thomas Claiborne, 26, of Douglas, CO also lost his life. Both Marines were affiliated with the Marine Light Attack Helicopter Squadron 469. “Sam”, as he was known by his closest friends, had decided as early as 3 years of age that he wanted to be a Marine. It wasn’t until he met a Naval pilot while attending Brunswick Elementary that he decided he wanted to fly. His parents Ann and David Leigh, were teachers at Messalonskee High School teaching English and Social Studies respectively. At Messalonskee “Carson” as he was known by his classmates, was a friend to all that knew him. In the classroom, Carson strived to achieve top marks and on the field he played soccer, basketball, club lacrosse with the same passion. He was a “Boy’s State” representative and while he did not pursue a career in politics he did carry on the family’s tradition of serving in the armed forces. Both of Carson’s grandfathers were World War II veterans and his uncle was a pilot in Vietnam. In their stead “Sam” went on to attend Norwich University, a military college in Vermont. While attending Norwich University he continued to develop into a leader. Discipline, integrity, confidence, critical thinking, adaptability, loyalty, and honor are the core values instilled in those who attend Norwich University. His family and closet friends would be the first to tell you that he always possessed these traits. After graduating from Norwich University in 1996, “Sam” enlisted as a Marine officer. As a Marine “Sam” quickly rose among the ranks, where he would achieve the rank of Major. He served two tours of duty in Iraq and was expecting to go to Afghanistan for a third tour of duty. His specialty was training new pilots. He took great pride in teaching his craft to those who dreamed of being a Marine aviator. His mentorship didn’t just stop at teaching new recruits but was spread to all who had a passion to become a military aviator. Unbeknownst to most of his colleagues Major Leigh was a major contributor (over 2500 posts) to a website devoted to providing new and fellow military aviators with “gouge” or helpful information and instruction on all things pertaining to aviation in the military. “Sam” really enjoyed the life he chose and was going to be a career Marine. To honor Major Samuel C. Leigh, his parents, David and Anne Leigh of Belgrade, Maine, donated this stone to The Summit Project. 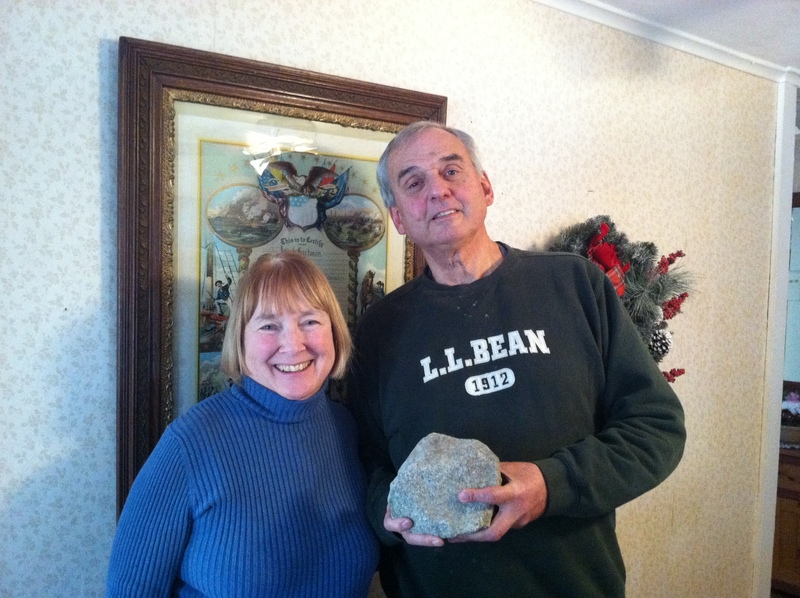 The stone comes from the Belgrade Lakes in Maine and was a 70th birthday gift to Samuel’s father, David. I was honored to carry the stone of Major Samuel C. Leigh up Bradbury Mountain. Every step up the mountain I thought about everything he might of been through, everything he had of seen in his career. Some of the things going through my mind is how brave he was to sign his self up to fight for the freedom of Americans. He is and always will be a true hero. Recently I signed up to fight for my country just like he did. As I was thinking about enlisting and as I was signing the forms I was thinking nonstop about what I’ll be giving up and had a understanding what I could be facing in my career. Knowing what I could be facing scared me at times, and knowing what I’ll be giving up effects me a little. Things I’ll give up are being able to be around my family, being at home, and being around my family. These might be minor things in some people’s eyes but when your not able to be at your house or around your friends and family for months to years, you will miss out on a lot of things. You can miss birthday parties, holidays, and even watching your children growing up, if you have children of your own. Then some things I’m scared about is facing enemies face on, getting home sick, not being able to know if your family is okay at home. The one thing that got me to still want to sign the papers are knowing I’ll be defending my country, I’ll be able to protect my family from over seas still by keeping terrorists away from the US. What I’ve learned in class got me to want to join more at times and the summit project just made me have pride that I enlisted. Fears I have are being away from my family and missing out on my niece and nephew growing up, and miss out on everything. The hopes I have are being able to learn new things, get in great shape, and make some new friends. I understand some of the thoughts that might been going through his mind while he was signing the enlistment forms and even thinking about joining the military. For me as I was thinking about joining and as I was signing the forms I was a little scared, I had to think long and hard about if this is really what I want to do. In over all I’ve learned most soldiers signed up because they wanted to defend their country, some joined for college, better life, adventure, and money. I enlisted to defend the freedom of the U.S and for adventure. In my American History class we are learning about different wars that have gone on. We are currently learning about the Vietnam war. Which was a very bad war. I’ve been told through others and websites that in the war there were enemies that were hiding in the hills. We’ve seen the chats of deaths and how many soldiers were sent over there. This hike got me to think about it a little and put faces to soldiers that have fought for our country. This hike also showed me that not all soldiers died in combat, a lot of them died in accidents, which is no less tragic. When I was handed my stone for the Summit Project for your son Major Samuel Leigh, I had tears in my eyes as I am so very honored to carry his stone and the memories of him. He is a true American Hero. Our journey together began on our Spring Ride for the Troops. He was put onto the motorcycle I was riding on and we did the ride together. I thought about Sam during the ride and felt a sense of pride in my heart being a part of this wonderful Summit Project and all the others who were also on the ride that day. The next leg of our journey will begin on May 23rd. Sam will be with my husband Bob and I as we begin the next part of our journey. Your son’s stone has more meaning to me as my own son Is named Samuel. I believe in fate and your son was meant to be with me. I was told I could have no children and my son is now 25 years old. So when I found out I was going to carry a Samuel I knew deep in my heart it was meant to be. When we arrived at our destination for our Spring Ride I placed Sam on the flat bed truck to honor him along with the others who were being honored that day. I had our photo taken with The 1st Lady Of Maine. Mrs. Ann Lepage. I am going to put that photo up on Facebook as my profile picture. That photo will be on my home page. When it came time to take a group photo with our Stones I saw everyone gathered by the truck. I started to yell wait for me. I stand at 4’7 inches tall and I heard someone say, “Diana is the smallest one here and she has the biggest Stone”. Also fate has brought us together. That photo will be on my home page. I was not supposed to take my stone home with me so we had an extended adventure. I took a photo of the stone on my kitchen table. Sam is and will always be in my heart forever. I will never forget him and all that he did in while he was in the Service and all the sacrifices he made to keep America safe and free. When I arrived at TSP table to collect my first ever stone your son’s was sitting proudly in the center of the table. I knew instantly that I wanted to carry his beautiful piece of granite. I have a special Marine in my life as well. Yesterday’s event was the Run for the Fallen 2015 in Brunswick, Maine at the Brunswick Naval Air Station. (I participated last year as well and found it to be one of the most rewarding experiences of my life.) I carried your son’s stone and ran until I found his sign and flags. I was overcome with emotion when I finally reached him just shy of two miles into the race. I laid his stone at the base of his sign and I knelt with him for several minutes. I truly felt the weight of his sacrifice in that moment, and I was so incredibly thankful and humbled to have been given the opportunity to honor him. Many people thought I was a family member, and stopped to rub my back or offer comfort. I accepted those condolences on your behalf, and I hope that you realize that Sam’s sacrifice is not forgotten or overlooked. The remainder of the run was a very personal experience for me. I felt the rough edges of the stone in my hands, switching back and forth as the weight pulled on my shoulders, and I let my fingers run over the engraving. People shouted from the sidelines their thanks that I was carrying a stone for The Summit Project. I truly felt it was an honor and welcomed the burden of the weight as a constant reminder during those 3 miles of all the freedoms my son and I enjoy because of the sacrifice of those I will never know. I didn’t know until I returned home that Sam was killed in an accident involving a USCG plane. I currently work as a civilian for the USCG, but I have already given my two week notice. I feel like this experience has put the cap on my four years with the USCG and I can part ways knowing I did my part to contribute in however small a manner. Maine’s Heroes Are Not Forgotten. Sam’s sacrifice will never be forgotten. I will tell my son about him, and I will ensure that his memory lives on. I can never thank you enough for raising your little boy into a good man. I work daily to shape my three year old into a man that will contribute to society like yours did. On October 17th, 2015 I had the honor of carrying Samuel’s stone up Cadillac Mountain in Acadia National Park. Sam gave the ultimate sacrifice just one day before my own son Samuel was born in 2009. I felt a connection to him immediately after reading his story and knew that it was important for me to carry his stone. My father was a combat veteran in the Vietnam War and he passed in 2002. He was such a proud veteran and just like his story, I want to make sure that Sam’s is told over and over again. In preparation for the hike, I wanted to learn everything I could about Sam. I learned that he loved being a pilot and that he loved teaching others who were learning as well. He knew that he wanted to be a Marine at the age of three and excelled academically and in sports. Once enlisted, I learned of how quickly he rose through the ranks…because he was driven. In the days leading up to the hike, I checked the weather three or four times a day wishing the forecast would change from showers to sunny. I began to get nervous as I am not a “hiker” and I knew the top of the mountain was rocky and would be very wet. As I stepped off the bus with my 19 teammates at the trailhead the morning of the hike, the sky opened up and the rain started coming down. I thought of Sam and his passion for learning and growing and his perseverance and immediately felt safe knowing that I was carrying his rock in my backpack. The rain quickly subsided and the hike soon turned into this wonderful event where 20 lives were being woven together carrying the rocks and we were sharing stories of our own lives in the midst of sharing the story of our hero. Midway through the hike, the most beautiful rainbow filled the sky and we all stopped, took pictures and took our rocks out of our bags. The rainbow followed us intermittently for the rest of the hike to the summit. The sun came out bright by the time we gathered in a circle with our rocks at the summit to share what we learned. We laughed, we cried, we shared food and clothing with each other and I will forever be changed by this experience. Samuel Carson Leigh was brave, passionate and set high standards for himself. He was the best version of himself that he could have been. My passion to keep our hero’s memories alive is why I joined the Summit Project. This hike made me step out of my comfort zone and see where I can improve to be a better version of myself. Moving forward, I know that he did not become a pilot in the US Marines by staying in his comfort zone. I will strive to be the best version of myself , just as Sam lived his life. I will share his story in my classrooms and encourage my students to live the same life of passion that he lived. I am honored to have carried his rock and I am honored to be able to share his story. In August 2015 I became a member of the elite group privileged to carry a Summit Project stone. In my reflection above you can read about my Run for the Fallen experience with Sam’s stone. After the run I was able to take home the beautiful sign that honored Sam and his service along the race route. I made a promise to myself, and to Sam’s family, that I would never let Sam’s service and his sacrifice be forgotten. This weekend, November 6th-9th, I was honored to be the organizer for an event in my home town that included the Summit Project. Although Sam’s stone was not included in the ten stones I was granted custody of, he was still very much a part of the events. I brought the cutout with his picture and his brief biography and placed it prominently behind the display with the ten stones laid out on a red velvet blanket. When people asked I explained that I’d had the absolute honor and pleasure of carrying Samuel C. Leigh’s beautiful stone 3.1 miles through the streets of the Brunswick Naval Air Station in August. I talked about his service and his sacrifice. Later that afternoon, in our second event of the day, I allowed another person to carry my stone from the race (Army CPL Jason D. Fisher) in the hike up Blue Hill Mountain in Blue Hill, Maine, and, instead, I carried Sam’s sign up the mountain. At the top we had a few moments of silence. Very different from the cold and windy morning run, our afternoon on the mountain was calm and sunny with a beautiful view across the region. In those quiet moments on the mountain summit, I couldn’t help but think about the amazing views Sam must have seen while he was flying. The views we can only dream about — seen only from high above the ground. One of my favorite national parks is Acadia, located on Mount Desert Island in the great state of Maine. I had never hiked at Baxter State Park before, or really been to the Maine northwoods. I was motivated to get involved with TSP because of my brother 1LT Joseph J Theinert. He was killed in action on 4 June 2010 in Kandahar, Afghanistan when he was hit with an IED while on dismounted patrol. While my brother is on my mind, I will also be hiking in honor of SGT. Blair W. Emery (KIA 30 NOV 2007, Baqubah, Iraq) and MAJ. Samuel C. Leigh (29 October 2009). While I did not get to meet the family of MAJ Leigh, it was an honor to carry his stone. As I hiked up the mountain, and my pack got heavy, I thought about Major Leigh’s dedication to service. He not only wanted to be an excellent pilot himself, but wanted to pass on his knowledge to other upcoming pilots as well. He was not selfish, or concerned with being better than anyone, who only wanted everyone to succeed. Unfortunately MAJ Leigh’s service was cut short when he was killed in a collision that took his life, along with his co-pilot’s, and the lives of seven Coast Guardsmen. Such a tragic event is difficult to understand, but you realize the training and work that must be done to maintain our armed forces as the greatest fighting force in the world. When a teammate of mine was struggling with the hike, as a group we made the decision to help them by taking their pack. I volunteered to help carry the extra weight, because I knew how important it was for the entire team to succeed. I believe that this is the mentality that MAJ Leigh approached his military service with. It is not about a single person, but rather it is about the team. In a larger sense our team is this great country, and to get to participate in The Summit Project to meet so many amazing Americans, I feel blessed. I hope to keep both SGT. Emery’s and MAJ. Leigh’s memory alive is by sharing their stories with some of my students on Shelter Island. While many know my brothers story, it is important they understand that his sacrifice was not a single event, but rather there are communities all around the country, that have not had the pleasure of their sons returning home. And while we will never replace these brave men and women, the best way we can choose to honor them, is to remember them. Participating in the The Summit Project has helped me to become a stronger person, through an enrichment of faith in my fellow Americans. This journey would not have had the same meaning for me if I was not hiking with stones for both SGT Emery and MAJ Leigh; I hope that the people reading this post, will understand how thankful I am for both their service, and for the opportunity to continue their legacy. While I might not be hiking every year, Emery and Leigh will make the climb each and every year; people will learn their story, and know their names. To be a part of that legacy is an absolute honor, that I will not soon forget. Once again to SGT Emery, MAJ Leigh, and their families, Thank You! I was honored to carry your son’s memory stone yesterday in the Summit Project Memory Walk in Cape Elizabeth. It humbled me to read his story and I am so thankful for his service to our country. I felt emotional when his stone was put into my hands. He appeared to be a wonderful man and Patriot. My husband is a former marine and my uncle was a gunner who was shot down in WWII over the Pacific. I regard the people who serve with high respect. It was a very cold day yesterday, but as I walked, I was warm and my pack was light. When we got to the Fort, we took some pictures and then huddled under the band rotunda as it was a cold 10 degrees but much less with windchill. We shared our stories and talked of the stones we carried in this frigid cold but this discomfort was nothing compared to what our heroes who serve endure. We then walked back to the library (the total walk being about 5 miles). It was hard for me to give this beautiful rock back in the end as I wanted to hold onto it a little longer and to think of Samuel as I felt a connection after this emotionally humbling day. I hope to carry his memory stone again soon when I hike in the white mountains of N.H. , as they are my go to place for peace and reflection. Memorial Day, May 29, 2017. The most meaningful Memorial Day of my life. I have always, with my family, celebrated with parades, flags and patriotism. Cemeteries where the parade ends, taps are played and a prayer is spoken for all who have served and made the ultimate sacrifice. Those have always been extremely meaningful and heartfelt occasions. Keeping with the meaning of Memorial Day is most important. So many have given up their lives so that all Americans can live as Americans choose. This Memorial Day 2017, has had a much deeper meaning for me. Not only could I spend the weekend honoring all who have given all, but was able to learn and give thought to one hero, over the course of several weeks. To share the story of this hero with others, honor him with a hike and carry the stone that bears his name. To learn about the family, friends and groups who were a part of this hero’s life. It really was an amazing thing to experience. One that I’ll remember and be able to reflect on every Memorial Day. Major Samuel Carson Leigh, United States Marine. Gave his life for our country on Oct. 28, 2009. His dad, David, told me just days before our weekend and hike that Sam had always wanted to be a Marine and it was something that surely completed him. Sam was always a hard working student and learning all he needed to become a pilot didn’t come easy. Sam became a great pilot, advanced rapidly, served 2 tours in Iraq and became a teacher of new recruits. He was also very active in spreading his knowledge to many others interested in military aviation. Sam was an exceptional Marine, an exceptional American and an exceptional Mainer. It was a great honor to Memorialize Major Leigh. To bring awareness, honor and glory to his name and his life. His life and his sacrifice will never be forgotten. Not as long as I’m alive to share about him. Thank you to his entire family for allowing me this privilege. Thank you to Major David Cote and The Summit Project. Especially, thank you to Major Samuel Carson Leigh, United States Marine Corp. Carrying your stone for 4.2 miles & bearing the aches & pain was a reminder of life. A reminder that it is because of those in the armed forces that have paid the ultimate sacrifice like yourself that I am able to silently complain about pain. Thank you for your sacrifice, Semper Fidelis. I carried Sam’s stone to the top of Cadillac Mountain in Acadia. I decided to address my reflection letter to Sam’s parents, Ann and David. I am truly humbled and honored to have carried your sons stone in memory of his sacrifice for our beloved nation. I too served in the Marine Corps and although I could never completely understand your loss, I can certainly relate to it. I have been involved in raising money and awareness for Veterans for many years across the country, and I can honestly say that participating with The Summit Project has been the most raw, real and moving experience I’ve had. For me, there’s a certainly peacefulness and serenity about being in nature, detached from the fast past world we all live in. It was a perfect opportunity for me to think about your son and why his sacrifice is so meaningful to our nation. Politics aside, I believe our country works to make our world a better place by eliminating evil. That would not be possible without the few and the proud who volunteer to serve and who believe in words like honor, courage and commitment. It is my hope that you can sleep a little easier at night knowing that you have a local community of people who understand your family’s sacrifice and who are here to support you in any way that we can, to include learning your sons story and sharing it with others for years to come.